The 2018 Commonwealth Games, officially known as the XXI Commonwealth Games and commonly known as Gold Coast 2018, were an international multi-sport event for members of the Commonwealth that were held on the Gold Coast, Queensland, Australia, between 4 and 15 April 2018. It was the fifth time Australia had hosted the Commonwealth Games and the first time a major multi-sport event achieved gender equality by having an equal number of events for males and female athletes. More than 4,400 athletes including 300 para-athletes from 71 Commonwealth Games Associations took part in the event. The Gambia which withdrew its membership from the Commonwealth of Nations and Commonwealth Games Federation in 2013, was readmitted on 31 March 2018 and participated in the event . With 275 sets of medals, the games featured 19 Commonwealth sports, including beach volleyball, para triathlon and women's rugby sevens. These sporting events took place at 14 venues in the host city, two venues in Brisbane and one venue each in Cairns and Townsville. These were the first Commonwealth Games to take place under the Commonwealth Games Federation (CGF) presidency of Louise Martin, CBE. The host city Gold Coast was announced at the CGF General Assembly in Basseterre, Saint Kitts, on 11 November 2011. Gold Coast became the seventh Oceanian city and the first regional city to host the Commonwealth Games. These were the eighth games to be held in Oceania and the Southern Hemisphere. The host nation Australia topped the medal table for the fourth time in the past five Commonwealth Games, winning the most golds (80) and most medals overall (198). England and India finished second and third respectively. Vanuatu, Cook Islands, Solomon Islands, British Virgin Islands and Dominica each won their first Commonwealth Games medals. On 22 August 2008, the Premier of Queensland, Anna Bligh, officially launched Gold Coast City's bid to host the Commonwealth Games in 2018. On 7 April 2009, the ABC reported a land exchange deal between Gold Coast City and State of Queensland for Carrara Stadium. According to Mayor Ron Clarke, the land would aid a potential bid for the 2018 Commonwealth Games. The land exchanged would be used as the site of an aquatics centre. In the same article, Mayor Clarke raised the question of the Australian Federal Government's commitment to a 2018 Commonwealth Games bid in light of the Government's support for Australia's 2018 FIFA World Cup Finals bid. On 16 April 2009, Queensland Premier Anna Bligh told reporters that a successful Commonwealth Games bid by Gold Coast City could help the tourist strip win a role in hosting the World Cup. "Some of the infrastructure that would be built for the Commonwealth Games will be useful for Gold Coast City to get a World Cup game out of the soccer World Cup if we're successful as a nation," she said. However the decision on the venues for the 2018 and 2022 FIFA World Cups were made eleven months prior to the bid decision for the 2018 Commonwealth Games, so the potential World Cup venues had already been chosen. On 3 June 2009, Gold Coast City was confirmed as Australia's exclusive bidder vying for the 2018 Commonwealth Games. "Should a bid proceed, Gold Coast City will have the exclusive Australian rights to bid as host city for 2018," Bligh stated. "Recently I met with the president and CEO of the Australian Commonwealth Games Association and we agreed to commission a full and comprehensive feasibility study into the potential for the 2018 Commonwealth Games," she said. "Under the stewardship of Queensland Events new chair, Geoff Dixon, that study is now well advanced." On 15 March 2010, it was announced that the Queensland Government will provide initial funding of A$11 million for the 2018 Commonwealth Games bid. The Premier of Queensland has indicated the Government's support for the bid to the Australian Commonwealth Games Association. On 31 March 2010, the Australian Commonwealth Games Association officially launched the bid to host the 2018 Commonwealth Games. In October 2011, Gold Coast City Mayor Ron Clarke stated that the games would provide a strong legacy for the city after the games have ended. On 10 November 2011, the Hambantota bidders claimed they had already secured enough votes to win the hosting rights. However, on 11 November it was officially announced Gold Coast City had won the rights to host the games. The event was overseen by the Gold Coast 2018 Commonwealth Games Corporation (GOLDOC). The GOLDOC was formed in 2012 by the Government of Queensland. Its headquarters were located in Ashmore, a suburban region of Gold Coast. In February 2012, Mark Peters was appointed Chief Executive Officer of the GOLDOC. The Queensland Government Minister tasked with overseeing the Games was Kate Jones. Peter Beattie AC served as the Chairman of GOLDOC who was appointed on 17 May 2016 to replace Nigel Chamier OAM. One of the key technical aspects of Gold Coast City's successful bid was the fact that the city had 80 percent of the planned venues in place before the bidding deadline. The vast majority of venues were located within 20-minutes driving time of the Athletes Village in Parkwood. Carrara Stadium, located in the suburb of Carrara, was the main venue for Athletics, the opening ceremony and the closing ceremony. The seating capacity of the stadium was temporarily increased to 40,000 for the games by the installation of a large temporary North Stand. The Gold Coast City Convention and Exhibition Centre, located in the suburb of Broadbeach, hosted Basketball, Netball (preliminaries) and Weightlifting events, also serving as the Main Media Centre and International Broadcast centre hosting over 3000 members of the worlds press. The Broadbeach Bowls Club hosted the Bowls competition. The Hinze Dam, located in the suburb of Advancetown, was the location for the Mountain Bike competition. A new course was constructed to meet international competition requirements and temporary spectator seating for 2,000 spectators. The newly built Coomera Sport and Leisure Centre hosted Gymnastics and Netball (finals). The existing sound stages of the Village Roadshow Studios complex in the suburb of Oxenford hosted the sports of Boxing, Table Tennis and Squash. During Games mode the venue was enhanced to provide for the International Sporting Federation technical venue requirements and provide spectator seating of 3,000 (boxing) and 3,200 (table tennis). The Gold Coast Hockey Centre hosted the men's and women's Hockey events during the games. The Southport Broadwater Parklands hosted Triathlon and athletic events. The Optus aquatic centre hosted the swimming and diving events. Robina Stadium hosted the Rugby 7s competition and upgraded to meet World Rugby standards. The Elanora/Currumbin Valley area hosted the road racing elements of the cycling programme. Coolangatta Beachfront hosted the beach volleyball event. Brisbane, along with the Gold Coast, forms part of the South East Queensland conurbation. Track Cycling was held at the Sleeman Sports Complex in the suburb of Chandler, where a new indoor cycling velodrome (Anna Meares Velodrome) was built. The Velodrome's seat capacity was 4,000 during the games mode. The Shooting disciplines were held at the Belmont Shooting Centre. In Tropical North Queensland, the Cairns Convention Centre and Townsville Entertainment Centre hosted the preliminary rounds of both the men's and women's basketball competitions. The Queensland state government spent A$1.5 billion (US$1.2 billion) to deliver the event. Out of this, A$550 million (US$425 million) were spent on the procurement programme. Procurement of the security and security infrastructure included contracts for four prime suppliers which delivered around 4,200 security guards. A$34 million (US$26 million) were spent on the deployment of the armed forces to provide rapid-response squads, bomb detectors, offshore patrols and surveillance. A$657 million (US$509 million) were spent for the construction of the venues and the Games Village. Additional A$2.6 billion were spent for the transport infrastructure. Seven Games venues were upgraded and only three were newly built and they were the A$105.3 million Gold Coast Sport and Leisure Centre, the A$40 million Coomera Indoor Sports Centre and the A$59 million Anna Meares Velodrome. More than A$6.4 million were spent on the Queen's Baton Relay. The countdown clock was unveiled on 4 April 2013, exactly five years from the opening ceremony of the games. The clock was shaped as a surfboard and was located at the beach end of Cavill Avenue in Surfers Paradise. The Countdown Clock was the first fixed element of the Commonwealth Games visual identity program. The ticket requests began on 24 April 2017 and ended on 22 May 2017. The first round of tickets were allocated on 22 June 2017 via a computer-generated ballot system. About 70% of the people who applied for the tickets had received some or all of the tickets requested in the first phase. In Australia, ticket prices ranged from A$10 for many events to A$495 for the most expensive seats at the opening ceremony. The games expected to have 1.2 million tickets for sale. Around 1.06 million tickets were sold by 3 April 2018. Ticketek was the provider of ticketing services for the games. The organizing committee expected 15,000 volunteers for the games. Over 45,000 applicants applied to become a volunteer. The uniforms for the volunteers were revealed on 11 November 2017 at the Gold Coast Convention and Exhibition Centre. Former Gold Coast Titans player Mat Rogers who was present at the uniform showcase ceremony, said that the uniforms were "very Gold Coast" and it was like an "active wear". Hard Yakka was the official supplier of the uniforms for the volunteers. At a charity gala held on 4 November 2017, the medals for the games were officially unveiled. Australian Indigenous artist Delvene Cockatoo-Collins designed the medals, while they were produced by the Royal Australian Mint. The design of the medals was inspired by the coastline of Gold Coast along with Indigenous culture. Furthermore, Cockatoo-Collins mentioned, "the medal design represents soft sand lines which shift with every tide and wave, also symbolic of athletic achievement, The continual change of tide represents the evolution in athletes who are making their mark, Records are made and special moments of elation are celebrated". Approximately 1,500 medals were created to be distributed to the medallists and each measures approximately 63 millimetres in diameter. The medals weigh between 138 and 163 grams. The 2018 Commonwealth Games Athletes Village was located on 59 hectares at Southport, Gold Coast. which provided accommodation and services to 6,600 athletes and officials in 1252 permanent dwellings. There are 1170 one and two bedroom apartments and 82 three bedroom townhouses which will serve as student accommodation to the nearby Griffith University. It offered services like laundry, refreshments and television and computer spaces and four residential pools. The village consisted a gym which was designed with guidance from the Australian Institute of Sport and the equipment was sponsored by Technogym. Adjoining the gym was the Athlete Recovery Area which provided services like plunge baths, including accessible baths, saunas, massage and consults from the Sports Medical personnel. The Main Dining served over 18,000 meals per day to the athletes during the games. The village also consisted of retail shops, Optus phone store, salon, bar and a games room which featured a number of arcade games, pool tables and game consoles. The Gold Coast 2018 Queen's Baton Relay was launched on Commonwealth Day, 13 March 2017, on the historic forecourt at Buckingham Palace, signalling the official countdown to the start of the Games. Accompanied by the Duke of Edinburgh and Prince Edward The Earl of Wessex, Her Majesty Queen Elizabeth II heralded the start of the relay by placing her 'message to the Commonwealth and its athletes' into the distinctive loop-design Queen's Baton which then set off on its journey around the globe. It traveled for 388 days, spending time in every nation and territory of the Commonwealth. The Gold Coast 2018 Queen's Baton Relay was the longest in Commonwealth Games history. Covering 230,000 km over 388 days, the baton made its way through the six Commonwealth regions of Africa, the Americas, the Caribbean, Europe, Asia and Oceania. During the games period, free public transportation within Queensland region was provided to ticket and accreditation holders. The free transportation services were available on local buses, train and Gold Coast light rail (G:link) services in Gold Coast and on TransLink and Qconnect bus services in Cairns and Townsville. The Gold Coast light rail system, connected a number of the key games venues including the Optus Aquatic Centre, Broadwater Parklands and the Gold Coast Convention & Exhibition Centre with the major accommodation centres of Surfers Paradise and Broadbeach and the Athletes Village at Parklands. An extension to the system was announced in October 2015, connecting the then current terminus at Gold Coast University Hospital to the railway line to Brisbane at Helensvale. The extension opened in December 2017, in time for the games. The Gold Coast 2018 Commonwealth Games Corporation (GOLDOC) delivered the event with a focus on sustainability under the guidance of the ISO 20121 event sustainability management system and the Global Reporting Initiative (GRI) framework Sustainability Reporting Standards. The GOLDOC received the Sustainability Award in the Australian Business Awards 2016 for focusing on sustainable practices and planning in the preparation of the games. The GOLDOC headquarters received the 4 Star Green Star – Interiors PILOT rating from the Green Building Council of Australia. The new Anna Meares Velodrome, built specifically for the games, is the first velodrome in the world to have full LED broadcast-quality lighting that cuts energy consumption by up to 60% and reduces running costs and carbon emissions. Following tradition, the host of the previous games, Scotland entered first, followed by the rest of the European countries competing. Following this, all countries paraded in alphabetical order from their respective regions. After the European countries entered, countries from Africa, the Americas, Asia, the Caribbean, and lastly Oceania marched in. The host nation of Australia entered last. Each nation was preceded by a placard bearer carrying a sign with the country's name. 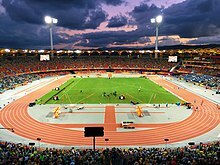 The closing ceremony was held at Carrara Stadium on Sunday 15 April and was produced by Jack Morton Worldwide at a cost of AU$30 million. Australian pop stars Guy Sebastian, Samantha Jade, Dami Im, Ricki Lee and The Veronicas were among the performers along with children's entertainers, The Wiggles. The program was broadly similar to that of the 2014 Commonwealth Games, with the major changes being the dropping of judo, the reintroduction of basketball, the debut of women's rugby sevens and beach volleyball. The ranking in this table is consistent with International Olympic Committee convention in its published medal tables. By default, the table is ordered by the number of gold medals the athletes from a nation have won (in this context, a "nation" is an entity represented by a Commonwealth Games Association). The number of silver medals is taken into consideration next and then the number of bronze medals. If nations are still tied, equal ranking is given and they are listed alphabetically by their three-letter country code. Australia tops the medal table rank with 80 gold, second England with 45 gold and third India with 26 gold. NEP Australia was the host broadcaster of the event. It produced high definition coverage of the event and delivered to the rights-holding broadcasters of other nations. In Australia, the games were broadcast live on three Seven Network channels - 7HD, 7TWO and 7Mate. In the United Kingdom, BBC provided Commonwealth Games coverage of more than 200 hours across BBC One, BBC Two, BBC Red Button, BBC Sport website, BBC iPlayer and BBC radio. ESPN provided the games coverage for viewers in the USA. Sony Pictures Networks India broadcast the games for the viewers in India on three channels - Sony Six, Sony Ten 2 in English and Sony Ten 3 in Hindi. Flow Sports provided games coverage in the Caribbean countries such as Anguilla, Antigua & Barbuda, Aruba, The Bahamas, Barbados, Bermuda, Bonaire, British Virgin Islands, Cayman Islands, Curaçao, Dominica, Dominican Republic, Grenada, Guadeloupe, Guyana, Haiti, Jamaica, Martinique, Montserrat, Netherlands Antilles, Saint Barthelemy, Saint Kitts & Nevis, St. Martin, St. Vincent & the Grenadines, Saint Lucia, Suriname, Trinidad & Tobago and Turks & Caicos. Flow Sports provided coverage of the event on Flow Sports 1, Flow Sports 2 and up to three additional "Flow Sports Extra" channels. The New Zealand government funded Pacific Cooperation Broadcasting Limited (PCBL) broadcast the event on Pasifika TV in the Oceanian countries such as Cook Islands, Fiji, Nauru, Niue, Papua New Guinea, Samoa, Solomon Islands, Tonga, Vanuatu, Kiribati and Tuvalu. The official motto for the 2018 Commonwealth Games was "Share the Dream". It was chosen to highlight the dreams and experience at the games that were shared by participants of the games, ranging from athletes to volunteers and the host country Australia to the world including the Commonwealth nations. The emblem was launched on 4 April 2013, which marked exactly five years until its opening ceremony. It was unveiled at the Southport Broadwater Parklands. It was designed by the New South Wales based brand consultancy WiteKite. The emblem of the 2018 Commonwealth Games was a silhouette of the skyline and landscape of Gold Coast, the host city of the games. Nigel Chamier OAM, former Chairman of the GOLDOC, said that it was the result of months of market research. Borobi was named as the mascot of the 2018 Commonwealth Games in 2016. Borobi is a blue koala, with indigenous markings on its body. The term "borobi" means koala in the Yugambeh language, spoken by the indigenous Yugambeh people of the Gold Coast and surrounding areas. The song ''Days of Gold'' composed by the Australian Duo band Busby Marou, which was released on 17 October 2014, was considered as the official song of the Mascot Borobi. The official partners of the games were The Star Gold Coast, Griffith University, TAFE Queensland, Longines, Optus, Atos and Woolworths Supermarkets. Griffith University was also the Creative Arts partner of the games and Presenting partner of the Gold Coast Marathon. TAFE Queensland was responsible for providing vocational education and training program for the volunteers of the games. Longines served as the official timekeeper of the games. The official song of the 2018 Commonwealth Games ''Welcome to Earth'' was recorded by the Australian Singer Delta Goodrem. The song was performed for the first time by Goodrem during the opening ceremony of the games. The song was worldwide released on 5 April 2018 in Delta Goodrem's official YouTube channel. On 2 April 2018, CGF chief executive David Grevemberg said that needles were found in a water bottle by a cleaner at the Athletes' village. The event has a no-needles policy. Grevemberg said he could not identify which team was involved. Later, Indian team manager Ajay Narang has said his team found the syringes in a water bottle outside their accommodation and he gave it to the Games medical authorities for analysis. The deputy chief coach of Indian athletics team Radhakrishnan Nair also said that the needles were found in the common area of the building and no Indian team member was involved in it. At least 13 athletes from four countries - Cameroon, Uganda, Rwanda, and Sierra Leone - absconded during or immediately after the Games. Some missed their competitions. Athletes regularly abscond during major sporting events, and many subsequently claim asylum in their host countries. Most hold nationalities that are deemed high-risk by immigration authorities and find it impossible to get visas outside of exceptional events, such as major games. A month after the games ended, officials estimated that fifty athletes had remained in Australia illegally, with another 200 staying in the country on visas. The organising committee decided to bring in the athletes before the start of the closing ceremony. This caused an uproar on social media as, contrary to public expectations, none of the athletes were shown entering the stadium during the ceremony. Broadcast rights holders Channel 7 complained on air about the decision and concluded that, "it hasn't really lived up to expectations". Many spectators and athletes left during the ceremony, resulting in a half-empty stadium for much of the event. Following this, the ABC claimed that Channel 7 was briefed on the closing ceremony schedule, a claim which Channel 7 later refuted. ^ "This Commonwealth Games will be remembered as a year of 'firsts', on and off the field". ABC News. 2018-04-13. Retrieved 2018-04-17. ^ "Up to 300 Para athletes participated in the 2018 Commonwealth Games". International Paralympic Committee (IPC). 16 April 2018. ^ a b "Gambia to compete at Gold Coast 2018 after readmitted as CGF member". www.insidethegames.biz/. Dunsar Media. 31 March 2018. Retrieved 3 April 2018. ^ "ABOUT | Gold Coast 2018 Commonwealth Games". Gold Coast 2018. Retrieved 2018-04-17. ^ sportscotland. "Louise Martin elected as CGF President". sportscotland.org.uk. Retrieved 2018-04-17. ^ "CGF General Assemble 2011". Commonwealth Games Federation. Retrieved 2018-04-17. ^ "Medal Standings - Gold Coast 2018 Commonwealth Games". results.gc2018.com. Retrieved 2018-04-17. ^ "CGF President declares Commonwealth more relevant than ever before as "Games of Firsts" draw to a close on Gold Coast". Commonwealth Games Federation. Retrieved 2018-04-17. ^ "Gold Coast eyes 2018 Games bid with land swap". Australian Broadcasting Corporation. 7 April 2009. Retrieved 26 May 2011. ^ "Bligh pushes bids for Games, World Cup". The Sydney Morning Herald. 16 April 2009. ^ "Gold Coast gets sole right to bid for 2018 Commonwealth Games". Brisbane Times. 3 June 2009. Retrieved 26 May 2011. ^ Lappeman, Sue (15 March 2010). "Coast Games bid up and running". Gold Coast Bulletin. Archived from the original on 9 March 2012. Retrieved 26 May 2011. ^ Lappeman, Sue (31 March 2010). "Coast Commonwealth Games bid backed". Gold Coast Bulletin. Archived from the original on 14 March 2011. Retrieved 26 May 2011. ^ Degun, Tom (23 October 2011). "Legacy benefits to Gold Coast of 2018 Commonwealth Games will be huge, says city's Mayor". Inside the Games. Retrieved 17 November 2011. ^ Ardern, Lucy (11 November 2011). "Sri Lanka boasting of Games bid win". Gold Coast Bulletin. Archived from the original on 13 November 2011. Retrieved 17 November 2011. ^ "Candidate City Manual" (PDF). Commonwealth Games Federation. December 2009. Archived from the original (PDF) on 5 July 2010. Retrieved 17 November 2011. ^ Ardern, Lucy (13 November 2011). "Coast wins 2018 Commonwealth Games". Gold Coast Bulletin. Archived from the original on 14 November 2011. Retrieved 17 November 2011. ^ "ABOUT | Gold Coast 2018 Commonwealth Games". Gold Coast 2018. Retrieved 2018-06-12. ^ "CONTACT US | Gold Coast 2018 Commonwealth Games". Gold Coast 2018. Retrieved 2018-06-12. ^ Willoughby,, Shannon. "Mark Peters named as Games CEO". Gold Coast News, 18 February 2012. Retrieved 14 January 2013. ^ Palaszczuk, Annastacia (10 February 2017). "Kate Jones appointed Minister for the Commonwealth Games" (Press release). Brisbane: Queensland Government. Retrieved 8 May 2017. ^ "Peter Beattie appointed new Commonwealth Games 2018 chairman". ABC News. 2016-05-17. Retrieved 2018-07-03. ^ "Our Team | Gold Coast 2018 Commonwealth Games". Gold Coast 2018. Retrieved 2018-07-03. ^ "Carrara Stadium | Gold Coast 2018 Commonwealth Games". Gold Coast 2018. Retrieved 2018-04-18. ^ "Gold Coast Convention and Exhibition Centre | Gold Coast 2018 Commonwealth Games". Gold Coast 2018. Retrieved 2018-04-18. ^ "Broadbeach Bowls Club | Gold Coast 2018 Commonwealth Games". Gold Coast 2018. Retrieved 2018-04-18. ^ "Coomera Indoor Sports Centre | Gold Coast 2018 Commonwealth Games". Gold Coast 2018. Retrieved 2018-04-18. ^ "Oxenford Studios | Gold Coast 2018 Commonwealth Games". Gold Coast 2018. Retrieved 2018-04-18. ^ "Gold Coast Hockey Centre | Gold Coast 2018 Commonwealth Games". Gold Coast 2018. Retrieved 2018-04-18. ^ "Southport Broadwater Parklands | Gold Coast 2018 Commonwealth Games". Gold Coast 2018. Retrieved 2018-04-18. ^ "Optus Aquatic Centre | Gold Coast 2018 Commonwealth Games". Gold Coast 2018. Retrieved 2018-04-18. ^ "Robina Stadium | Gold Coast 2018 Commonwealth Games". Gold Coast 2018. Retrieved 2018-04-18. ^ "Coolangatta Beachfront | Gold Coast 2018 Commonwealth Games". Gold Coast 2018. Retrieved 2018-04-18. ^ "Anna Meares Velodrome | Gold Coast 2018 Commonwealth Games". Gold Coast 2018. Retrieved 2018-04-18. ^ "Belmont Shooting Centre | Gold Coast 2018 Commonwealth Games". Gold Coast 2018. Retrieved 2018-04-18. ^ "Cairns Convention Centre | Gold Coast 2018 Commonwealth Games". Gold Coast 2018. Retrieved 2018-04-18. ^ "Townsville Entertainment and Convention Centre | Gold Coast 2018 Commonwealth Games". Gold Coast 2018. Retrieved 2018-04-18. ^ http://www.accaglobal.com, ACCA -. "2018 Commonwealth Games takes schedule and budget golds | ACCA Global". www.accaglobal.com. Retrieved 2018-05-24. ^ "Queensland after the Commonwealth Games: An Olympic destination?". Retrieved 2018-11-15. ^ a b "'Excessive costs': Commonwealth Games baton relay charged taxpayers a fortune". ABC News. 2018-07-02. Retrieved 2018-11-15. ^ "The countdown to the Games begins | Gold Coast 2018 Commonwealth Games". Gold Coast 2018. Retrieved 2018-06-24. ^ "2018 Gold Coast games ticket schedule released". ABC News. 2017-04-05. Retrieved 2018-06-21. ^ "Last minute rush in 1.2m bids for 2018 Gold Coast Commonwealth Games tickets". ABC News. 2017-05-23. Retrieved 2018-06-21. ^ "Miss out on Commonwealth Games tickets? Don't give up just yet". ABC News. 2017-06-22. Retrieved 2018-06-21. ^ "TICKET PRICING | Gold Coast 2018 Commonwealth Games". Gold Coast 2018. Retrieved 2018-06-22. ^ Halloran, Emily (2018-04-03). "140,000 tickets unsold one day out from Commonwealth Games". Brisbane Times. Retrieved 2018-06-22. ^ "TICKETEK | Gold Coast 2018 Commonwealth Games". Gold Coast 2018. Retrieved 2018-06-22. ^ "Gold Coast 2018 Commonwealth Games volunteer uniforms unveiled". Gold Coast Bulletin. Retrieved 24 June 2017. ^ "HARD YAKKA | Gold Coast 2018 Commonwealth Games". Gold Coast 2018. Retrieved 2018-06-24. ^ Crockford, Toby (4 November 2017). "Gold Coast 2018 Commonwealth Games medals revealed". Brisbane Times. Brisbane, Queensland, Australia. Retrieved 4 November 2017. ^ Pavitt, Michael (4 November 2017). "Gold Coast 2018 reveal medal designs for Commonwealth Games at charity gala". Insidethegames.biz. Dunsar Media. Retrieved 4 November 2017. ^ "Games Village". Embracing 2018. 18 April 2017. Retrieved 12 October 2017. ^ "Inside the Commonwealth Games Village | Gold Coast 2018 Commonwealth Games". Gold Coast 2018. Retrieved 2018-04-18. ^ "Commonwealth Games Federation - Queen's Baton Relay". www.thecgf.com. Archived from the original on 22 July 2017. Retrieved 26 August 2017. ^ "Your Travel Options | Gold Coast 2018 Commonwealth Games". Gold Coast 2018. Retrieved 2018-04-19. ^ Commonwealth Games 2018: Australia athletes banned for doping. The Australian (2018-04-12). Retrieved 2018-04-15. ^ "SUSTAINABILITY | Gold Coast 2018 Commonwealth Games". Gold Coast 2018. Retrieved 2018-06-12. ^ "Gold Coast 2018 Commonwealth Games Corporation (GOLDOC)". ABA100 Australian Business Awards®. Retrieved 2018-06-12. ^ "GOLDOC HQ | Green Building Council of Australia". new.gbca.org.au. Retrieved 2018-06-12. ^ "Anna Meares Velodrome / Cox Architecture". ArchDaily. 2017-09-04. Retrieved 2018-06-12. ^ "Opening Ceremony". www.gc2018.com/. Gold Coast 2018 Commonwealth Games Corporation (GOLDOC). Retrieved 20 March 2018. ^ "Commonwealth Games: Gold Coast event starts with colourful opening ceremony". BBC Sport. 4 April 2018. Retrieved 5 April 2018. ^ Giles, Thomas (20 December 2017). "Team Scotland release Gold Coast 2018 parade tartan". Insidethegames.biz. Dunsar Media. Retrieved 24 March 2018. ^ "71 Nations and Territories. 6 Continents. 2 Billion citizens. 1 commonwealth family". www.gc2018.com/. Gold Coast 2018 Commonwealth Games Corporation. Retrieved 8 October 2016. ^ Mackay, Duncan (14 October 2016). "Maldives set to miss Gold Coast 2018 after resigning from Commonwealth". www.insidethegames.biz/. Dunsar Media. Retrieved 16 October 2016. ^ "Gold Coast 2018 to host largest Commonwealth para-sport programme". www.paralympic.org/. International Paralympic Committee. 3 March 2016. Retrieved 23 August 2016. ^ "Exclusive: Beach volleyball to be played at the 2018 Gold Coast Commonwealth Games". Gold Coast Bulletin. Retrieved 5 April 2016. ^ "Women's rugby added to Commonwealth Games". www.sportsnet.ca/. Rogers Media. 7 October 2014. Retrieved 23 August 2016. ^ "Level playing field for women at 2018 Commonwealth Games". The Scotsman. Edinburgh, Scotland. 7 October 2016. Retrieved 7 October 2016. ^ McKay, Duncan (7 October 2016). "Gold Coast 2018 to offer same amount of medals for men and women after seven events added". Insidethegames.biz. Dunsar Media. Retrieved 7 October 2016. ^ "Broadcasting | Gold Coast 2018 Commonwealth Games". Gold Coast 2018. Retrieved 2018-06-14. ^ "About - NEP Host Broadcast Gold Coast Commonwealth Games 2018". www.nephb.com. Retrieved 2018-06-14. ^ a b "Commonwealth Games 2018 live Stream Gold Coast TV Schedule". commonwealthgames2018.live. Retrieved 2018-05-21. ^ a b "BBC - Gold Coast 2018 Commonwealth Games on the BBC - Media Centre". www.bbc.co.uk. Retrieved 2018-05-21. ^ a b "ESPN acquires Commonwealth Games rights in USA for first time in 2018 | Featured News| News | Sportcal". www.sportcal.com. Retrieved 2018-05-21. ^ a b Hawkes, Rebecca. "SPN India gears up for Commonwealth Games coverage | Programming | News | Rapid TV News". www.rapidtvnews.com. Retrieved 2018-05-21. ^ a b "CANOC Grants Flow Broadcast Rights for 2018 Commonwealth Games - St. Lucia Times News". St. Lucia Times News. 2018-03-26. Retrieved 2018-06-14. ^ a b "Gold Coast 2018 Commonwealth Games Coverage in the Pacific". Pasifika TV. 2018-03-12. Retrieved 2018-06-14. ^ "DAZN CANADA LANDS EXCLUSIVE RIGHTS TO 2018 COMMONWEALTH GAMES | Commonwealth Games Canada". www.commonwealthgames.ca. Retrieved 2018-06-14. ^ "unifi TV | unifi Commonwealth Games". unifi.com.my. Retrieved 2018-07-29. ^ Astro.com.my. "Get your GC2018 Season Pass and Cheer for Malaysian Athletes at the Gold Coast 2018 Commonwealth Games | Press Release | Mediaroom | Astro". www.astro.com.my. Retrieved 2018-05-21. ^ "Singapore did not block RTM newsfeeds". ^ "TVNZ announces Gold Coast 2018 Commonwealth Games coverage | New Zealand Olympic Team". New Zealand Olympic Team. 2018-03-01. Retrieved 2018-05-21. ^ "Mediacorp : Catch Team Singapore at Gold Coast 2018 Commonwealth Games on Mediacorp's breadth of platforms". Mediacorp. Retrieved 2018-06-14. ^ Haden, Alexis (2018-03-31). "Everything you need to know about the 2018 Commonwealth Games opening ceremony". The South African. Retrieved 2018-06-14. ^ "Emblem unveiled for 2018 Commonwealth Games". 2013-04-04. Retrieved 2018-04-25. ^ "Gold Coast Games logo unveiled - Mumbrella". Mumbrella. 2013-04-04. Retrieved 2018-04-25. ^ "Commonwealth Games emblem revealed". Brisbane Times. 2013-04-03. Retrieved 2018-04-25. ^ Larkins, Damien (3 April 2016). 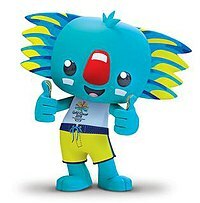 "Blue koala Borobi revealed as mascot for 2018 Gold Coast Commonwealth Games". ABC News (Australia). Sydney, New South Wales, Australia. Retrieved 5 November 2017. ^ "Duo behind theme song for Commonwealth Games' mascot Borobi a 'classic reconciliation model'". NITV. Retrieved 2018-06-14. ^ "SPONSORS | Gold Coast 2018 Commonwealth Games". Gold Coast 2018. Retrieved 2018-06-04. ^ "Griffith University | Gold Coast 2018 Commonwealth Games". Gold Coast 2018. Retrieved 2018-06-04. ^ "TAFE QUEENSLAND | Gold Coast 2018 Commonwealth Games". Gold Coast 2018. Retrieved 2018-06-04. ^ "LONGINES | Gold Coast 2018 Commonwealth Games". Gold Coast 2018. Retrieved 2018-06-04. ^ "WELCOME TO EARTH, NEW DELTA SINGLE". auspOp. 5 April 2018. Retrieved 12 May 2018. ^ "Games officials confirm syringes found in athletes village | CTV News". www.ctvnews.ca. Retrieved 2019-03-25. ^ Apr 01, The Associated Press · Posted:; April 2, 2018 10:54 PM ET | Last Updated:; 2018. "Commonwealth Games officials say syringes found in athletes village | CBC Sports". CBC. Retrieved 2019-03-25. ^ Press, Australian Associated (2018-04-02). "Commonwealth Games village syringes undergo DNA testing". The Guardian. ISSN 0261-3077. Retrieved 2019-03-26. ^ "India denies owning syringes found in Commonwealth Games Village". SBS Your Language. Retrieved 2019-03-26. ^ "Still no sign of missing African Commonwealth Games athletes". NewsComAu. Retrieved 2018-04-19. ^ Doherty, Ben (2018-04-11). "Cameroon athletes missing from Commonwealth Games". the Guardian. Retrieved 2018-04-19. ^ "Commonwealth Games: Fifty athletes in Australia 'illegally'". BBC News. Retrieved 21 May 2018. ^ "Almost 200 Commonwealth Games athletes and officials seek asylum in Australia". The Guardian. Retrieved 21 May 2018. ^ "Commonwealth Games closing ceremony slammed on social media as Channel Seven hosts open fire". Australian Broadcasting Corporation (ABC). Sydney, Australia. 15 April 2018. Retrieved 15 April 2018. ^ "Seven was briefed on closing ceremony". ABC News. 2018-04-16. Retrieved 2018-04-17. ^ Cunningham, Melissa (2018-04-16). "Griggs hits back at claims Channel Seven knew plan to snub athletes". The Sydney Morning Herald. Retrieved 2018-04-17.